Let us be honest with ourselves, we may not be able to rustle up a fabulous Michelin starred Braised Confit and Roasted Herdwick lamb main course like Gordon Ramsey, or a Roast Fillet of Monkfish with Braised Fennel and New Season garlic like Rick Stein, or a Lemon Drizzle Cake the way that Mary Berry can do, but you can still look the part. Many of you have bought the Head Chef grinders, and from your feedback we know just how good that they are. 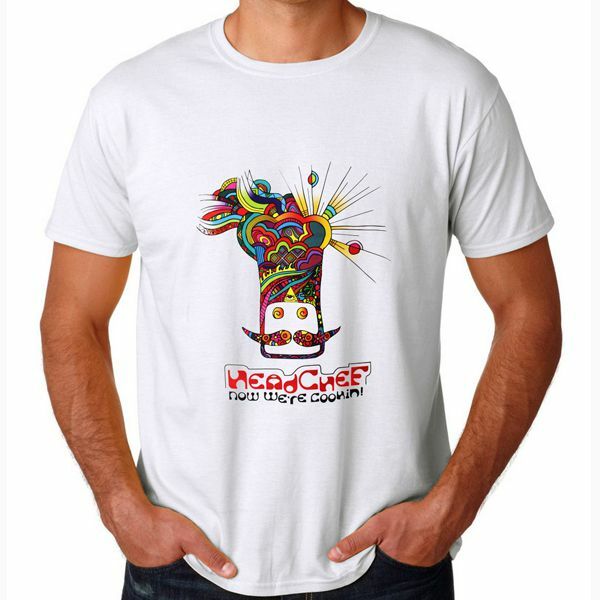 However, we have to tell you that Head Chef makes more than just grinders and one example is the vibrant and funky T-shirt which still features the moustachioed logo, but this is displayed in vibrant and psychedelic colours and patterns. In common with their other products the Head Chef T-shirt is of excellent quality and is offered by us in a size that will fit anyone who usually wears a men’s large size, measuring 21.5 inches across the chest, approximately 55mm. Now with the summer upon us and dad firing up the barbeque, this short sleeved T-shirt, plus perhaps a few rump steaks, is all that is needed to make the weekend go with a swing.